Good day my friends. It just rained a while ago so any attempts to do anything outside might be a bit damp. The sun is trying to come out but looks like it might be like this on and off all day. So lets do something fun.....lets do our Garden Plant Pokes as I promised I would show you in a previous post. I will be showing you how to do the paper ones because they are relatively quick but for anyone that wants to paint them I will give you a few suggestions for prepping before you do them. And of course a finished pic of various ones I did to give you an idea. First of all gather some paper supplies together, find some nice paper, scissors, some rub-on stickers, regular stickers, words, glue, stamps, printed images, brads, flowers or whatever tickles your fancy. Next, cut a pice of paper to slightly larger than your surface of your poke. 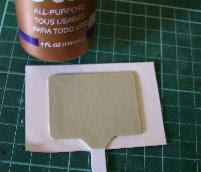 Cover the one side with glue then press on the back of your printed paper. 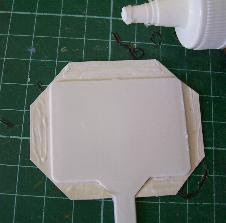 You can let it dry at this point or continue but be careful you don't want to tear your damp glued paper while fussing. Next cut across the corners as shown close to the corners on the tag on all 4 corners. 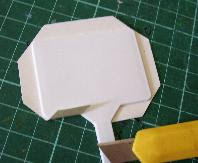 Being careful with a craft or X-acto knife, cut along the bottom as shown so that piece flips up and you will be able to glue it down later. Do this cut on either side of the stem part of the poke. 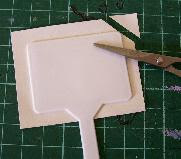 If your paper is still damp from the glue then you may end up tearing while cutting so be patient and let dry, use a heat gun if you aren't or just be slow and cut carefully so you don't tear it. Next apply a good glue, I used Aleene's Tacky Glue, and apply to all 4 flaps. Now a side note here if you don't want to do these steps then you can just glue your poke to the paper face down and not bother with all this but make sure your paper is dry if you attempt to just cut around the excess paper and have the front covered. I like a finished look to things because people always turn things over to see if they are finished. I learned this a long time ago when I was learning to paint and did shows. 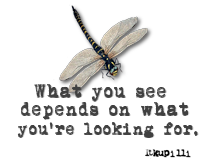 People do turn things over and they do look. 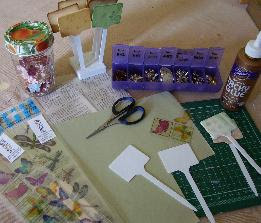 Now press those flaps down and hold them for a bit to make sure you have covered the flaps and they are sticking. If they start to lift, just add another dab of glue. 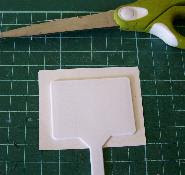 Now that the front is covered, take another piece of the same coloured paper, put glue on the backside that the flaps you just glued down are, press the garden poke onto the paper. Let dry then carefully cut all the way around . You now have the back and front done and now to decorate. This is how the back looks, just like the front only you might see the plastic corners are a bit exposed. Here are some finished plant pokes. Some I stamped on, some I collaged, some I used Rub-on, and of course here is one I painted, well 2 are painted but the snowman is an actual stamp but I didn't use ink I used black paint to brush on my stamp then stamped it on the painted white surface. Now my friends who paint, before painting I took a fine grit sandpaper, lightly sanded the one side giving the surface a bit of tooth. Then I wiped them then put a coat of all purpose sealer on them. Let them dry then go ahead and paint. As usual let your paint coats dry between coats, as you can see in the Saltbox house I painted and shaded, the snowman I just shaded the one side of the body in a nice blue, painted the nose orange, put a little white on top to look like a bit of snow on his nose and there you have it. So have fun my friends. Need a quick little gift for a grandparent, get a plant and make them smile, put a plant poke in the plant, use these as little signs for your craft projects, place in a cupcake all dollied up for a friend's birthday, you don't have to limit yourself to just plants. 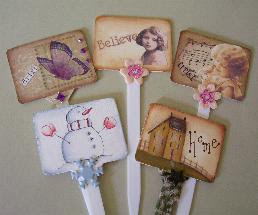 I suggest these not be used for outdoors since they are painted and paper. All that work and you don't want them to get damaged. Have fun and let's see some of your plant pokes. 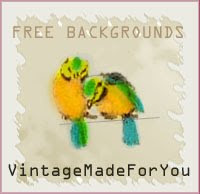 Enjoy and leave me a comment if you need any help or just want to share what you do. Thanks for the tut.. they look great.. sure they will be great sellers and gifts..
What a great idea!..lovely gifts for those who love indoor plants!